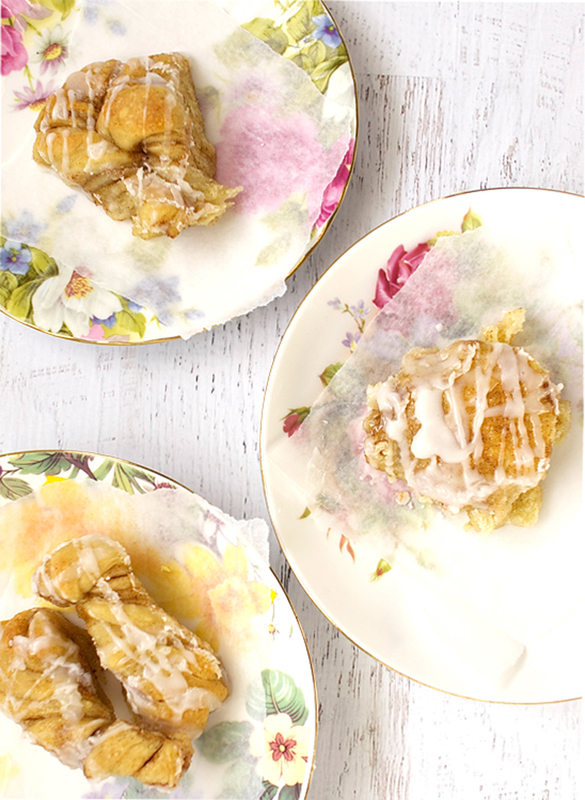 If you’ve never eaten Maple Cinnamon Twist then you really should consider trying this recipe. 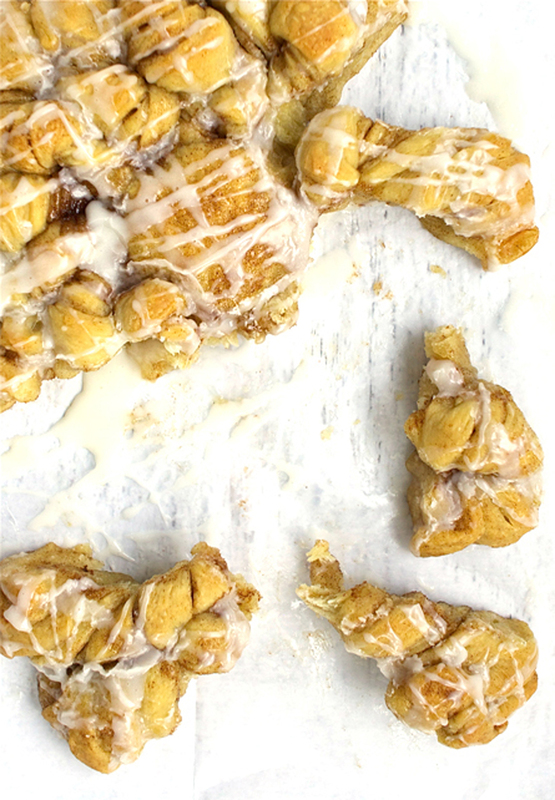 It’s basically a giant maple cinnamon danish that’s sweet, buttery and just delicious. It can be the beautiful centerpiece to your brunch menu or the perfect start to any old morning. You just need to have this in your life in some way because it’s that good. Like a lot of the recipes I post, this one can also be made ahead and flash frozen for future use. If you’re going to do that, I suggest making it into the smaller rounds rather than the large round because it’ll be much more manageable in your freezer. When I had this baking in the oven Charlie yelled, “Mmmm, Mom, I want some of that french toast!” And he was exactly right – it smells and tastes just like a giant loaf of french toast. And see that round piece in the middle there? 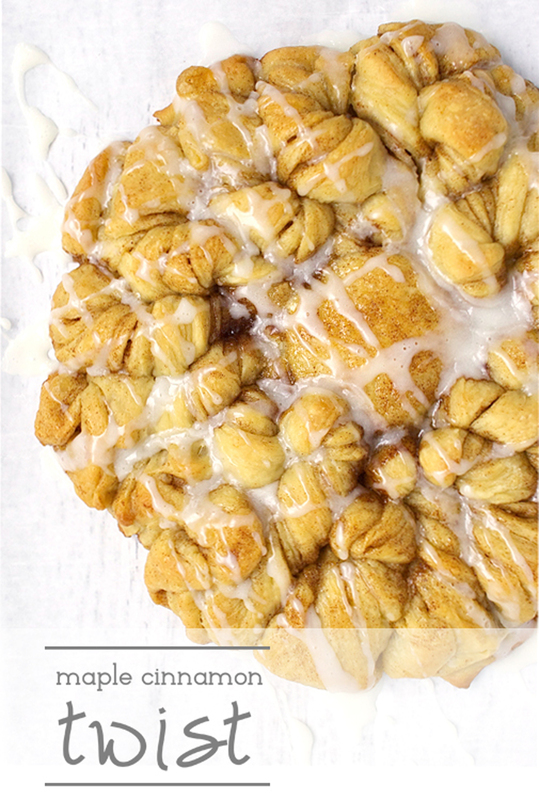 Everyone will be fighting over it because it’s juicy, cinnamony and the best part. I must say, It’s pretty hard to go wrong with this treat. Mix together the dry ingredients: flour, salt and sugar. In a small sauce pan, warm the milk and add the butter to the warm milk - keep stirring until the butter has melted then let the mixture cool. Dissolve the yeast in 1/2 cup of water and add 1 tbsp of maple flavoring to the water, set aside. Add the milk liquid, yeast liquid and lastly the beaten eggs to the dry ingredients. Knead the dough with your hands and add in flour a little bit at a time until the mixture is moist but not sticky. Cover the dough with plastic wrap and place in a warm place away from any drafts (I always put my dough in the closet that has all the equiment for the TV because it gets so warm in there!). Allow the dough to rise for 1 1/2 - 2 hours (or until the dough has doubled in size). While the dough is rising, prep the Cinnamon Sugar Filling (see below). Divide the dough into 3 balls (this will make one large Maple Cinnamon Twist; if you want 4 smaller ones that are 8" round, divide the dough into 4 balls and then divide each of those balls into 3 - you'll have a total of 12 small balls of dough). On a lightly floured surface, roll out each large ball into 12" circles (if you're making them small the circles will only be about 6"). Fit one layer of dough onto a greased or parchment paper lined baking sheet and get ready to layer on your Cinnamon Sugar Filling. Mix the ingredients together using your hands, if you want, to get it really well blended - remember, if you're not making one giant Maple Cinnamon Twist, divide the filling into however many rounds you're planning on making (2 or 4) and then go from there with the following directions for each one you make. 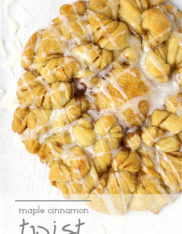 Brush the dough with melted butter and evenly sprinkle 1/3 of the cinnamon sugar filling on top. Continue the same steps with the remaining 2 layers of dough (end with the cinnamon sugar filling exposed). Use a small juice glass to mark a 2" circle in the center of the dough (be careful NOT to cut through the dough). Make cuts from the outside edge of the glass out to the edge of the dough. You want to end up with 16 pie shaped wedges - the best way to do this is cut the circle in half and then keep cutting each section in half until you get 16 wedges. Twist each wedge 4 or 5 times - remove the glass once you're done twisting. Cover the dough with plastic wrap and let it rise again for about 1 hour. Bake at 325F for approximately 20-22 minutes or until golden brown. Whisk together the ingredients and add more milk a little bit at a time until you reach your desired consistency. Drizzle the baked treat with the glaze while it's still warm (but not too hot - about 5-10 minutes).